The Chinglish Files by olr: Pretty lost in translation in this hospital. Tricky one at first, makes sense if you know that mistakes like these result from a rather obvious lack of sensitivity for the various shapes of Latin characters. The mixup of "d" and "p" or "D" and "G" are classic examples. 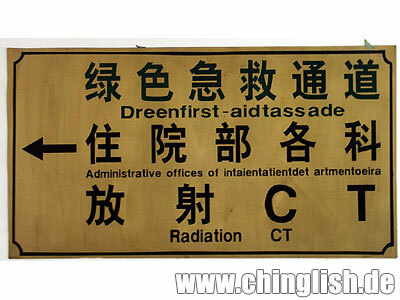 First line is a "green first-aid passage". The hospital is obviously operating on a color system. "Administrative offices of all inpatient departments." The only thing I don't get is the "oeira" at the end of this line. Shot in a hospital in 成都 Chengdu. Many thanks, Christoph! So amazing that you can read and correct it! Yeah, I think it should be "area". Sometimes I think: if you translate, do it correctly; if you cannot, use sign language. That may be a better policy. Our administrative govnt really makes me laugh, and cry. hmmm this is bizzare, as a northen Chinese I don't have these mixups i think. maybe this has something to do with the local chengdu accent. the Sichuaneses are famous for their accents. Green does not suggest a color system. In Chinese 'green' also indicates 'convenient', 'high efficiency', and 'unblocked/no need to wait'. @fz: So, although I don't speak Chinese myself, it looks like the first line might be a literal translation of the Chinese for "Emergency Room." @hugo m. nijhof and king:"Oeira" strongly evokes the Brazilian Portugese term "capoeira," which is a popular martial art/exercise discipline. This combination of phonemes appears nowhere else in English, as far as I know. My wild guess is that the sign's translator is familiar with capoeira, but not English, and transposed "-oeira" and "area." I agree with matt stevens that the "oeira" is strongly reminiscent of Portuguese, and much of the rest of the smushed-together text reminds me of German. It wouldn't surprise me if a translator were confusing bits of the Western languages floating around his or her head. I'm amazed at how you are able to translate it into a much-more-understandable speech. having studied english for 7years, I don't think my English is that good, because I think it's very tricky to trasnlate those medical terms or cultural essence into another language. Good job.